The day began at 3.30am. I woke up and lay in bed, unable to sleep. Then I became aware of a faint rumbling, which at first I thought must be from tractors working late in the fields to sow whatever they were sowing, before the rains predicted for tomorrow arrive. But it continued, gradually growing louder. I opened the window to discover it was actually a distant thunderstorm, gradually, ever so gradually approaching. I kept the window and curtain open. My kidney area was feeling a little stiff, so I did some stretching, and then lay back in bed, watching the ceiling light up with each flicker of lightning, listening to the still muffled thunder echo all around the landscape. 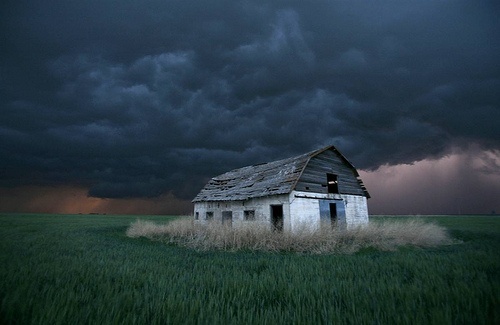 I just lay there, as the storm slowly, slowly slid towards the village. Although still miles away, each burst of lightning flashed on the ceiling more clearly, more brightly, and each clap of thunder grew rounder, echoing with an increasingly tangible contour around the surrounding prairie. A tension in the air was thickening, in parallel with the nervous barks of village dogs reacting to the storm. The wind began to pick up. More lightening, more thunder, every few seconds. And then a faint pitter-patter as the first drops of falling rain kissed the leaves of the bushes outside the window. A sense of relief began to replace the saturated tension in the air. Frogs began to comment. From a rhythm of individual raindrops, the tempo increased into a blurred, gentle hiss of sound. And then, without actually passing overhead, the storm just continued to slide past, its path destined for elsewhere. As gradually as it had approached, it receded, almost stealthily into eventual silence. It all happened in a single, slow arc. After closing the window again to go to sleep, I checked the time: 5.30am. Two hours, in a single arc of time. When I finally got up a couple of hours later, I felt less physical resistance to the start of the day compared to the previous few days. No heavily beating heart. The first mission of the day was to go into town to buy a replacement for our fridge, which I had discovered was broken. (Not that anything had gone rotten: given the water fast, it was completely empty!) Everything was fine while on the go, and energy levels were good – I even forgot that I was fasting. When the delivery guy arrived, though, he couldn’t get his truck into the driveway, so I had to carry one end of the new fridge in, and then one end of the old fridge back to his truck. Physically it wasn’t a serious challenge in terms of weight, but the exertion did go straight to my heart, and once again the intensity and tempo of my pulse shot up. Since then, I’ve spent many hours in the garden just being. Today there was no trouble making the transition from all the doing in the morning – running errands, planning a bit of teaching, as well as engaging in a bit of manual labour – to not doing anything. I’m interested whether the smoother rhythm which seems to have set in over the past couple of days will be disturbed tomorrow. I have to return to Budapest for a couple of days, which means that for the first time I’ll be faced with people, family and family cooking, as well as the kids’ energy levels. I know that during previous fasts it’s been difficult to smooth my own energy levels with theirs. Physically no symptoms, except that, since yesterday afternoon, I’ve noticed a developing stiffness-soreness in my hamstrings. Not sure what this is; I haven’t done anything since the beginning of the fast to stress them. I wonder whether it’s some kind of a healing crisis going on, because over the last six months I’ve been on the verge of developing hamstring tendonitis (as a result of increasing my running mileage to prepare for an ultramarathon, as well as doing a lot more training in the hills). By Day Six it could well be healing, and similar things have happened to me on previous fasts at around this point, just less potently. We’ll find out at the end of the fast – but I’m not going to try to find out too soon by immediately training. I’ve learned from previous fasts that if I’m too eager to start running again (within a day or so of breaking the fast) I get sore muscles and run the risk of injury. I read somewhere that, following a fast, the body’s priority is to rebuild the internal organs first, before rebuilding muscles. I don’t know whether anyone can prove this, but it does makes a lot of sense. One final thing. It struck me today how interesting it is that yesterday – when I began to surrender my resistance to time – also brought with it the first answers to a major question I was hoping to resolve while fasting. Work. Where am I headed? Can it be simple coincidence that within hours of each other, I received an invitation to give a lecture at a major yoga festival this summer, as well as an email from someone offering to help me organise an upcoming workshop? Maybe. Maybe not. But as long as you resist the universe, as long as consequently you’re not listening, the universe can’t speak to you!